I love tofu and would stand up in a culinary court and argue its case as one of the most diverse but under-used ingredients. When cooking tofu you need to respect the shyness of its flavour. It never wants to stand out from the crowd but will always surprise you when you least expect it! 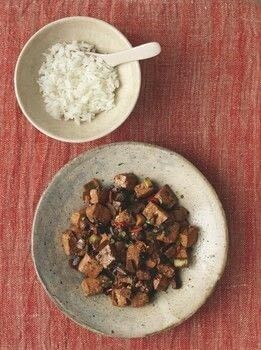 Black beans are wonderful with tofu as they are strong and salty in taste, adding layers of flavour. Don’t overdo the salt – allow the bitterness of the beans to embrace and uplift the placid nature of the tofu in this dish. GOK COOKS CHINESE by Gok Wan, is out 10th May in Hardback by Penguin/Michael Joseph, £20. The book is the official tie-in to Gok’s TV cookery series on Channel 4 which began on 21st May. © 2019 Gok Wan / Penguin · Reproduced with permission. Drain the shiitake mushrooms through a sieve placed over a clean bowl. Reserve 150ml of the soaking liquor. Chop the mushrooms roughly into small dice. Drain the black beans and put to one side. Heat the oil in a wok over a medium to high heat. Add the garlic, chilli, ginger and spring onions. Stir-fry the vegetables for 2 minutes. Add the drained and chopped mushrooms, and continue to stir-fry for a further 2 minutes before adding the drained black beans, reserved mushroom liquor, Shaoxing rice wine and both soy sauces. Bring the mixture to the boil and simmer for 2–3 minutes. Serve as part of a larger meal or simply with plain rice for a healthy vegetarian option.